Bristol City (A) Friday 19th April 2019 (12pm) - Hob Nob Anyone? We have an initial allocation of 1,528 for this fixture. Dreadful pricing for a Good Friday fixture only kind of down the road for us. I am out. Grow up and support your team. £32 is nothing. £32 is more than Premier League away games and is £12 more than what we charged them. I would say there are a lot of people that are balking at the idea of paying that, plus transport. I am not in the country so wouldn't be going anyway. Didn't they do this before on Boxing Day or something? Old Man Andrews Grow up and support your team. £32 is nothing. Carry on moaning about it on Twitter though eh, sure everyone wants to listen. You are the biggest whiner on the hashtag. Midday ko is a bit annoying. IN anywayz. Concession tickets 3 pound cheaper, very generous. 32 quid for a noon kick off on a bank holiday with the usual travel complications that brings - will be very impressed if we sell out that allocation. Pepe the Horseman Midday ko is a bit annoying. IN anywayz. Can I suggest a bag of cans for the train, Pepe? £32 I can afford that easy cuz I'm loaded. Not going out of principle we charge them £20. Big difference. F..k em. We should only charge £20 to teams that do likewise. it`s all wrong. windermereROYAL We should only charge £20 to teams that do likewise. it`s all wrong. Maybe charge the other teams double? Nope like for like, or the same prices as our non-member home fans. Where are we drinking? Last couple of times I've been to Brizzle there's been no booze in the ground. Is that still the case? Sorry to say guys it's going to have to be an a much earlier start than first thought! 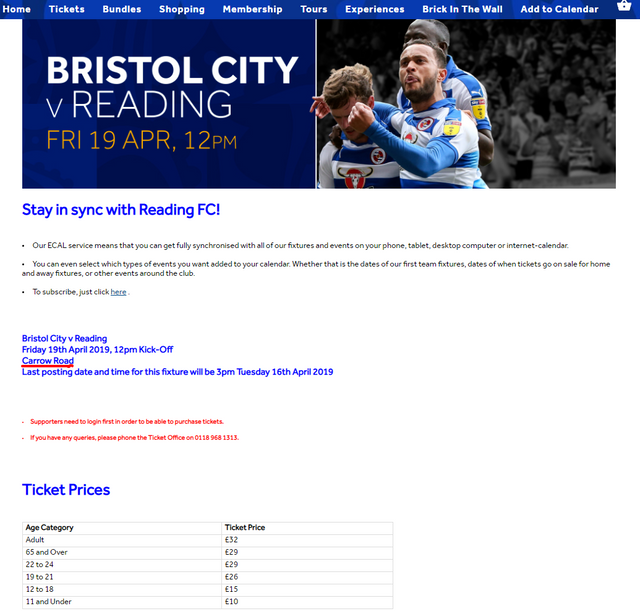 Was fully expecting the relatively short journey to Bristol but according to the Reading site, the game will now be held in Norwich. Readingfanman It's £32, not nothing. Don't listen to John Smith, he is just a troll. 32 quid for a game in a dump like Bristol.... ridiculous pricing. I am out of this due to the extortionate price And time and will be going to Tranmere to watch FGR play for a more reasonably priced game and better standard of football.